The best stews combine ingredients that really make their origin shine, and I did just that with this Southern fish stew. After a fishing trip to Mobile Bay with my friend Joe Baya of Great Days Outdoors, where we targeted sheepshead, I came home with lots of fish. 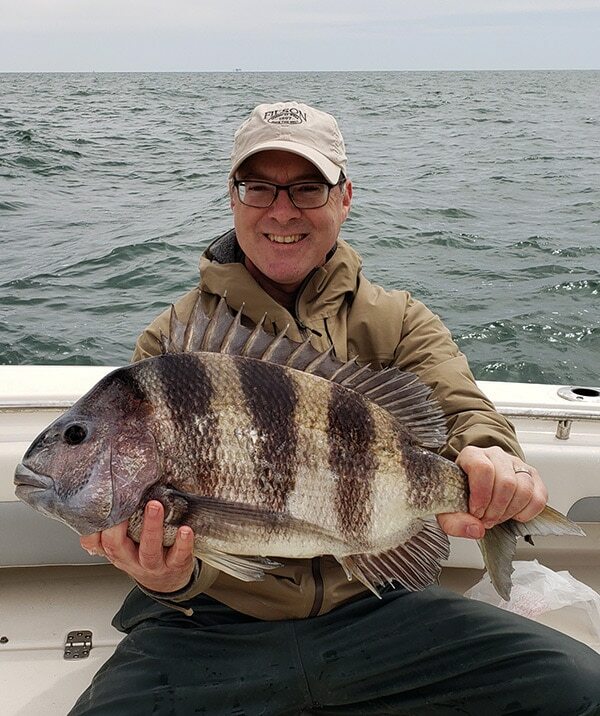 Sheepshead, Archosargus probatocephalus, is a cousin of the porgy or scup and looks a little like a gigantic panfish or surf perch — if it was in jail. I used to catch them as a kid in New Jersey, where we’d call them “convict fish,” for their black-and-white stripes. They are immensely fun to catch, and their diet is high in crustaceans and mollusks, so their meat is almost crab-like. White, firm, flaky. Sheepshead make a great stew fish, but many other fish would work here, too. Bass fillets, snapper, grouper, black seabass, Pacific rockfish, perch, lingcod, chunks of pike, and, above them all, tautog, which is the finest stew fish in North America. 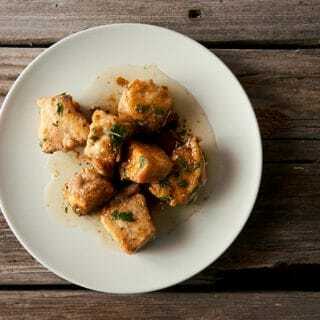 But as this is a Southern stew, tautog, a Northeastern fish, would be out of place. 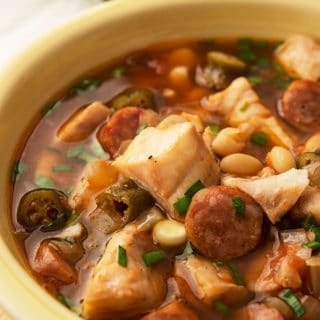 The inspiration for this Southern fish stew is a dish known as Alabama camp stew, which is normally made with a selection of canned ingredients so you can make it in deer camp. Canned tomatoes, corn and beans, and, well, canned pork, which I am not a fan of. While this stew does use canned tomatoes, I made my own hominy from heirloom Tennessee corn, and used dried black-eyed peas. You can use canned hominy (or some other corn), and canned beans, too. I also used dried okra I had in the pantry. I happen to like reconstituted okra a lot, better than frozen, but any sort of okra would be good — especially fresh! Another thing I like in this stew is the use of chicken (or in my case, pheasant) broth instead of a fish broth. You can use either, but the chicken broth tames the fish-ness of the stew. The fish then becomes a welcome guest in the stew, not a main player. 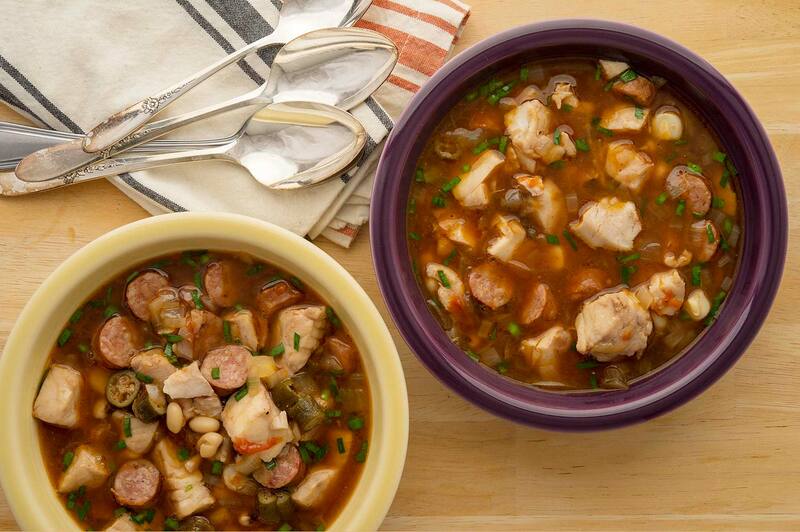 This stew uses a special seasoning blend common in the South called Cavender’s Seasoning. I’ve seen it in supermarkets here in Northern California, but if you can’t find it, skip it or add some garlic and thyme. 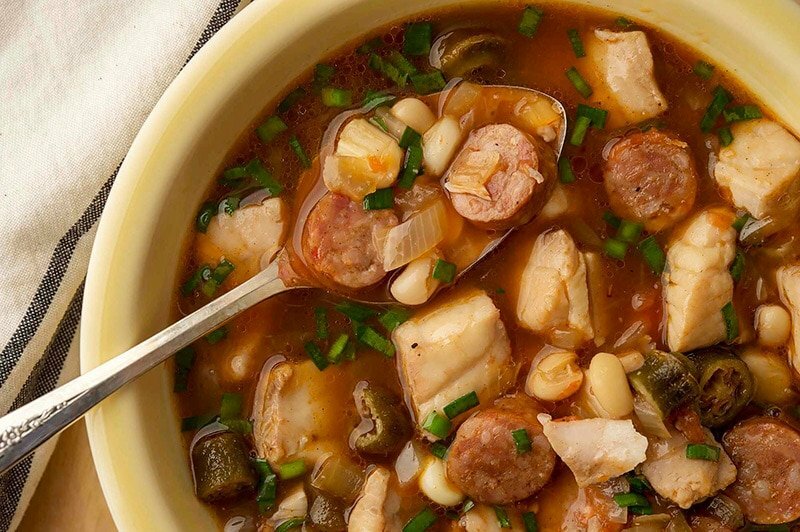 A final piece to this Southern fish stew is very, very Southern: Conecuh sausage. Those of you who know, know. For those of you who don’t, Conecuh is to Alabama as Taylor Ham is to New Jersey: A breakfast meat with a cult following. It is a proprietary recipe, and there is nothing exactly like it. That said, any smoked sausage you like will do. The result is a rich stew that gives you different flavor combinations at every bite. The fish is, as I mentioned, present, but not overwhelming. If you want a more seafood-y stew, I suggest adding things that sheepshead eat: shrimp and crab. Both would b great additions. You can also sub in homemade fish stock for the chicken stock to make it more oceanic. I made this with sheepshead, but you can use any fish that is firm, freshwater or saltwater. If you can't find Conecuh, use whatever smoked sausage you like. In a large soup pot, heat the bacon fat over medium-high heat and saute the chopped onion, stirring often, until it just begins to color around the edges, about 5 to 8 minutes. Add the okra and Cavender's seasoning and stir well. Saute this for 3 minutes or so if you have fresh or frozen okra. If you are using dried, just mix it around a bit. Pour in the water, stock and crushed tomatoes. Bring to a simmer and add salt to taste. Add the hominy, beans and sausage. Simmer, don't boil, for 15 minutes. Add the fish and simmer another 10 minutes. Stir in the chopped chives and serve. If you want to bulk this up a bit, crush Saltines into the soup while eating. You can find more than 100 recipes for all varieties of fish, right here on Hunter Angler Gardener Cook! Grind cold pork through large plate. Combine seasonings and cure with ice water and add to meat. Mix well and regrind through 3/16” plate. Stuff into 35-38mm hog casings. Cold smoke with Hickory 8-10 hours, raise smokehouse temp to 150-160 and smoke 4-5 hours.